Star Lord is one of the few Marvel superheroes with a look you could get away with at your local dive bar on a Saturday night. Now, we're teaming up with Angel Jackets to give you the chance to win an authentic recreation of his signature jacket. 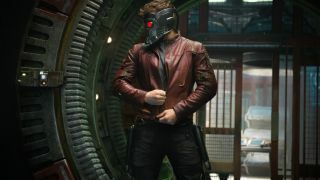 "The Star Lord Jacket is an authentic recreation from the movie Avengers: Infinity War, worn by Chris Pratt as Star Lord in the film," says Angel Jacket's description. "This Avengers: Infinity War jacket is ideal for all the Marvel comics fans and for casual fashion lovers." To enter, just head over to the GamesRadar+ Twitter account, give us a follow, and retweet this tweet. We'll pick a winner next week, so make sure you've retweeted by April 3 at 12pm PT. The winner will be chosen at random, and our choice is final. Click here for the full terms and conditions. GamesRadar+ readers can also grab a $15 discount on the Infinity War collection. There's a catch, though - you need to spend over $115 to apply it, and it's only available to the first 20 customers who use it. Head over to Angel Jackets now to be one of the lucky few. For all the details on Avengers: Infinity War head over to our comprehensive primer.